When I did the survey earlier this year about "Who has the best fast food French fries" I got more than a few "None of the above" answers. 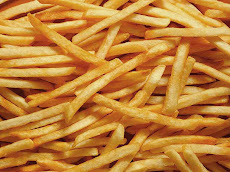 So I asked you folks, if not among the choices, who has the best fast food French fries? 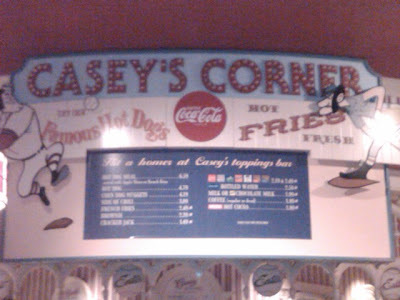 One of the answers I got was Casey’s Corner in the Magic Kingdom in Walt Disney World. Seeing how I was going to be there this week, I just had to try Casey’s Corner. It’s down on the corner end of Main Street as you enter the Magic Kingdom, and as it’s named after the poem by Ernest Thayer and subsequently the 1946 cartoon short by Disney, it’s appropriately decorated. Baseball themed, you get to sit on the bleachers in the back, or at a number of real tables either inside or outside. But come on, here, you just have to sit on the bleachers, and if you do, you get to watch vintage sports-oriented Mickey Mouse and Goofy cartoons from the 1930s and 40s. How can you beat that? The atmosphere is great, perfect for hot dogs are terrific, steamed and very very baseball park. The rest of the fare follows suit as you can also get stuff like Crackerjacks as well. The reason I’m here of course though are the fries. 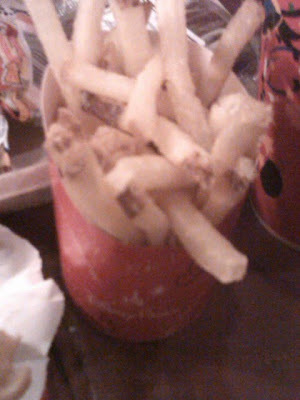 They are standard Disney natural regular cuts and come in a cute little Frypod-ish cup. They were not great, but not bad either. I myself would not put them at the head of the pack – but the atmosphere at Casey’s certainly puts them up there. A lot of the time at Disney, it’s all in the presentation, and if everything else is great – it brings the stuff that’s not so great up a level or two. That’s definitely the case with the fries at Casey’s Corner. Don’t miss this hidden treasure in the Magic Kingdom. Burger King Fries in Stores? French Fry Diary 40: IKEA… Fries?